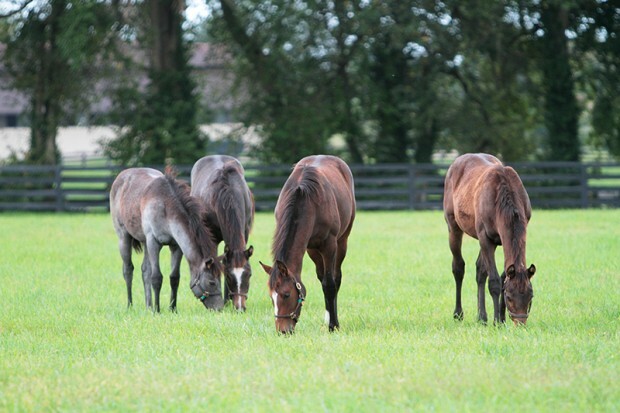 Zenyatta and her filly are both happily settled into their new routines. 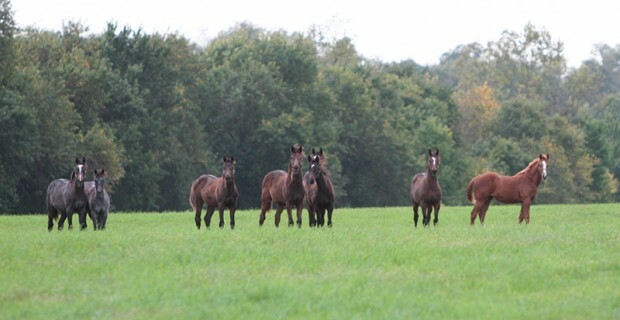 Alys sent us these photos of our girls enjoying life at Lane’s End. Z Princess, center. Photo by Alys Emson. 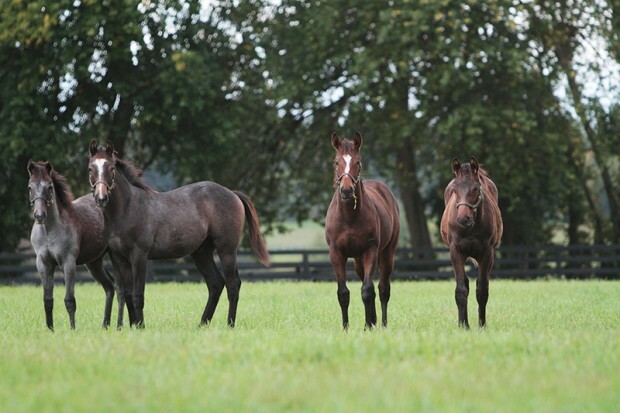 Z Princess and paddock mates. Photo by Alys Emson. The email I got I really didn’t understand it went on to say. In Parentheses (If the stewards consider it inadvisible to run on the turf it would be run on the main track at seven furlongs.) Would that just be an In Case Senario. Just had not seen that posted before. What do you think. 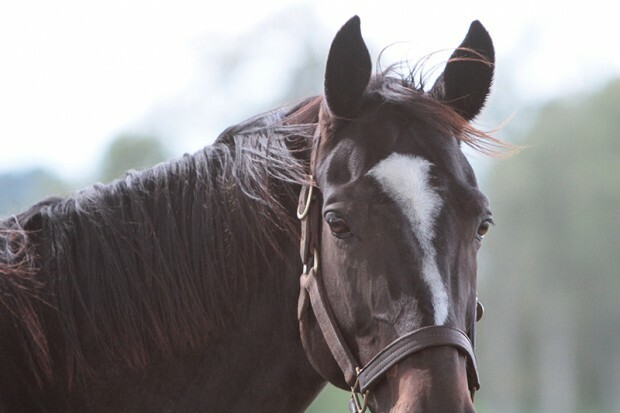 Thank you for posting the 2010 interview with Laura Hillenbrand about Zenyatta! This was a welcome respite from the sadness of this week and from Ebola news. Wonderful to walk down memory lane, as you called it — Love it! Lots of Hugs and Love to you, LM, PC, HT, Captain, Boo, Frank and ALL the sweeties! A million apologies! Lots of Hugs and Love to Dubai — lots of prayers for healing, too! So sorry that I didn’t put his name on the list above. Sometimes my mind works in fits and starts. More apologies are due! I somehow left Hercules off the list, too. So sorry, Herc. Love and Hugs to you, too! Goodnight and Sweet Dreams to all! There is a certain degree of sameness in your life and mine…a sameness that says no matter how different we are…we can still identify with each other’s daily problems and hopes and aspirations. You may have that basic quality of serenity and quiet confidence…and I of frivolity and eagerness…but we can still communicate through our basic sameness and through friendship, or o li i, as we Cherokees call it. If there is any greatness or strength in either of us, it will be from the standpoint of our consideration for each other and our understanding of unspoken concerns and the need for support…for the thread of sameness is from the Great Spirit that touches not only us but all with whom we are in contact…a silent bond that makes us one in courage. Friend and brother. It was the will of the Great Spirit that we should meet together this day. Dear Kathy.Oh,I got soaked in town today,very heavy thundery showers and we’ve been promised the tail end of an Atlantic storm this weekend.It’s such fun living in the UK given our climate! !I love that Joey is still handing out advise for Halloween,there were pumpkins in our supermarkets today. Did you see that beautiful video of the cat kissing the dolphins,it was delightful.Sad story on Zoe about all those dogs that died also a Senators son involved I was shocked though that the fraud is more serious charge than the cruelty!!! Were Marty’s martians messaging last night?? ?He did look cute in his hat.Fubu isn’t messaging a lot this week he’s being missed by his fans.Mango got some more onesies yesterday.Had to laugh she wanted her own cheque book! !Grumpy cat has got his new book out ready for Christmas,I think there’s a film too!Hope you have a great day.Love and hugs to you,Kisses for Holly,Nikko and Sugar.Sheena. Don’t get too wet. Remember you have a nice weekend coming. Yes, it’s very sweet that we are still getting advice from Angel Joey. Pumpkins, apples, fall foliage…all a sign of the season. Yes, that was a wonderful video of the cat with the dolphins. The story of all those dogs dying was just sickening. I agree, the cruelty should be most serious. Loved the pic of Marty picking out hats at his little hat dresser. Adorable! Mango is a very loved little girl. I wonder what the count is now on her little outfits? The Grumpy Cat book sounds like a must read. The movie will be very cute, I’m sure. Have a happy Friday Eve! Hugs and love from me, kisses from Holly, Nikko and Sugar. Kathy. Has anyone seen any information about when and what race is scheduled for Pennmarydel at Laurel this week? I have been looking but can’t find a listing. Thinking of Scooter. Sending more positive thoughts and prayers for smooth surgery and recovery. Hope you are doing okay. Thinking of you and Comet. Hope you are both doing well. Will continue sending prayers and positive thoughts for your sweet doggie. I still can’t get over the tragedy of losing Z14 Princess. Did she crash into another horse? Crash into the fence?